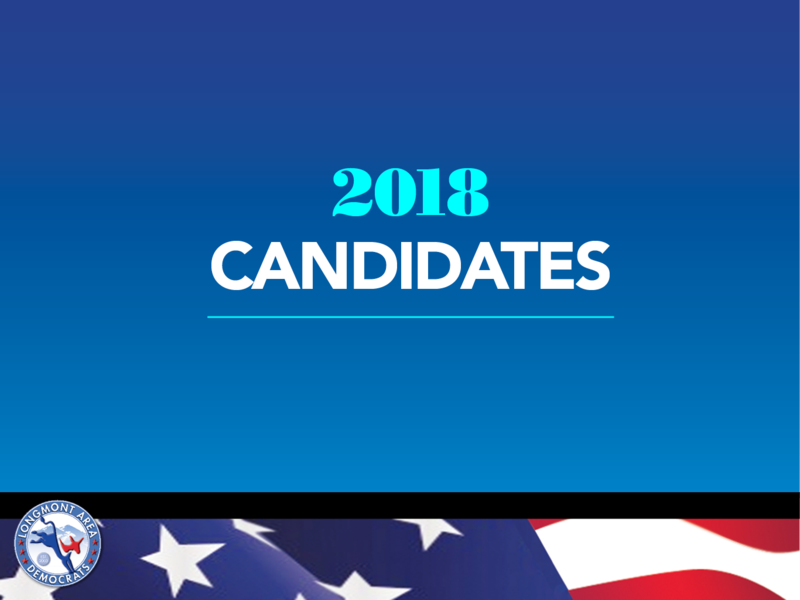 THE 2018 COLORADO MIDTERM ELECTION IS TUESDAY, NOVEMBER 6. 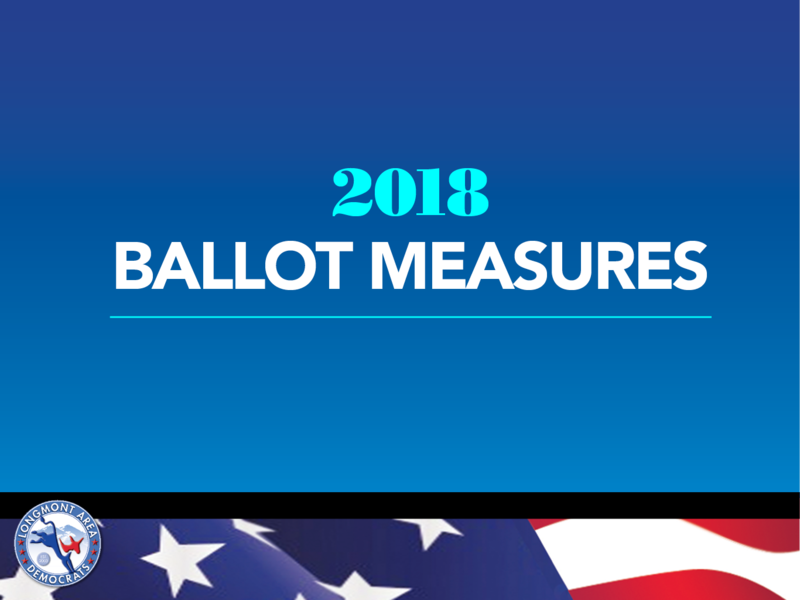 All Colorado elections are mail-in ballot, and if your address is current you should receive your ballot in the mail about mid-October. 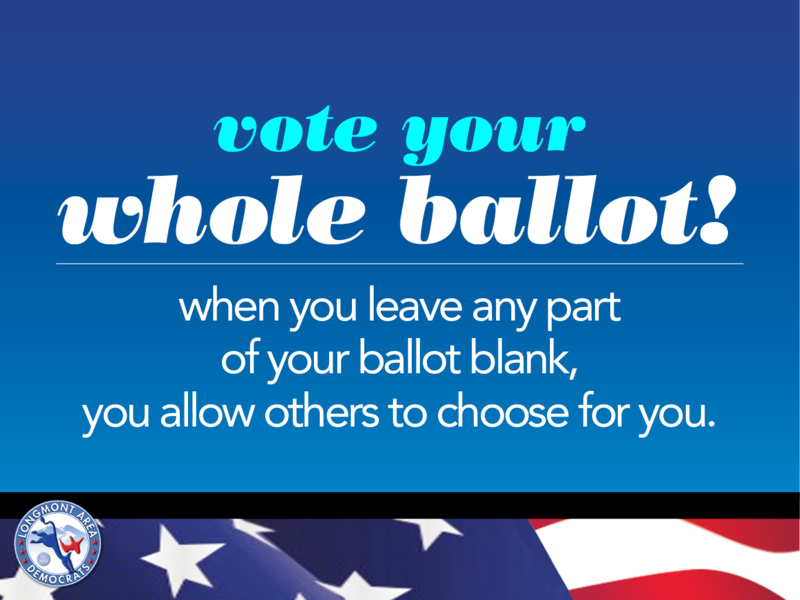 (Your address needs to be current by October 29 in order to be sent a mail-in ballot.) 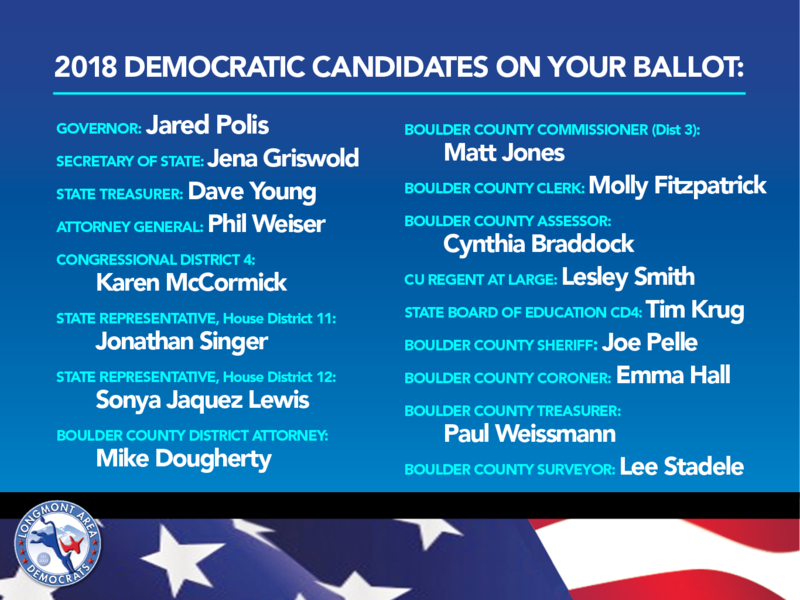 Be sure to check your voter registration at govotecolorado.com to make sure your address is current, and TELL EVERYONE YOU KNOW TO REGISTER TO VOTE. You can register to vote on any day, including Election Day, where you can fill out your ballot at a Voter Service Polling Center. 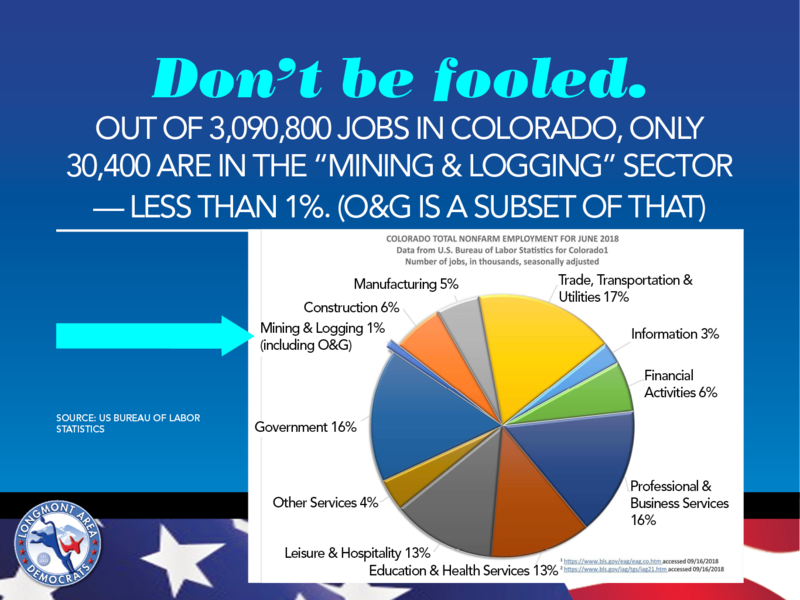 Go to bouldercounty.org/elections for more information. 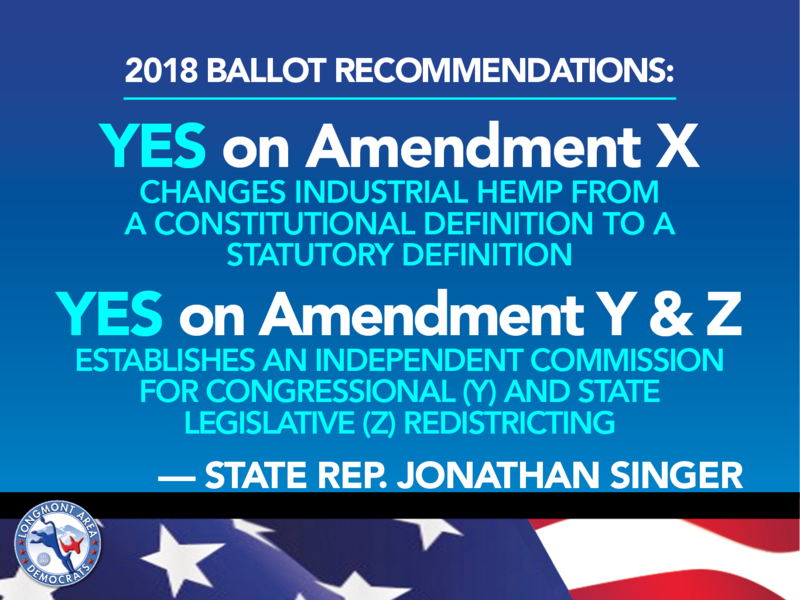 PLEASE VOTE YOUR WHOLE BALLOT! Each race, if filled by a Democrat, will ensure protection of our democracy against what might soon become an extremist Supreme Court! If you know an unaffiliated voter, please encourage them to vote their whole ballot, and to vote for Democrats in every single race! 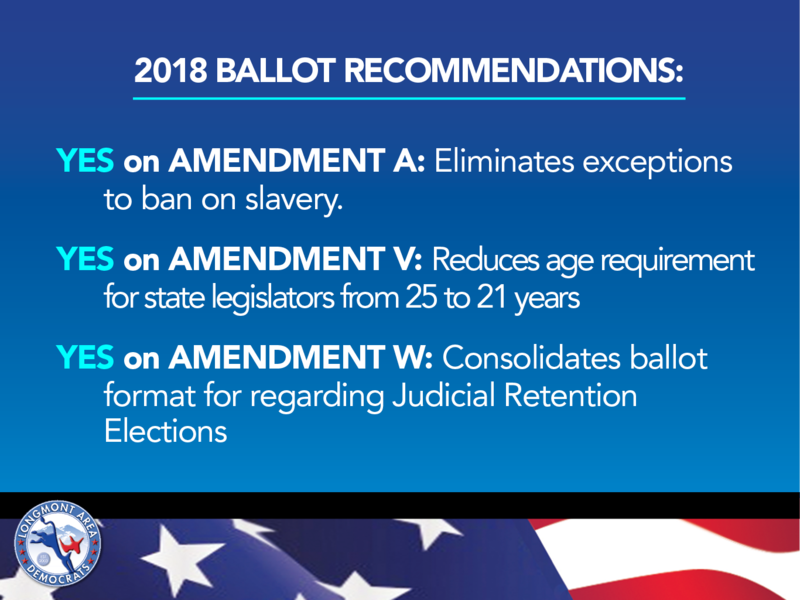 PLEASE, VOTE YOUR WHOLE BALLOT! When you don’t vote your whole ballot, you allow others to choose for you, and EVERY OFFICE and BALLOT ISSUE stands to affect you in your everyday life. 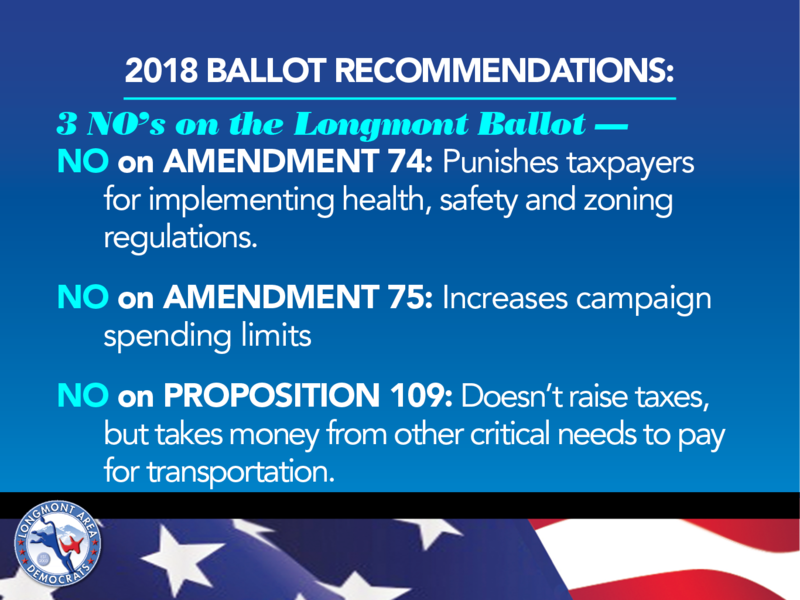 Plus, when we have leaders elected on the Federal level who do not have Colorado values at heart, our state and local elected representatives can pass laws, can stand in defense of Democracy and can protect our state’s residents from egregious policies. 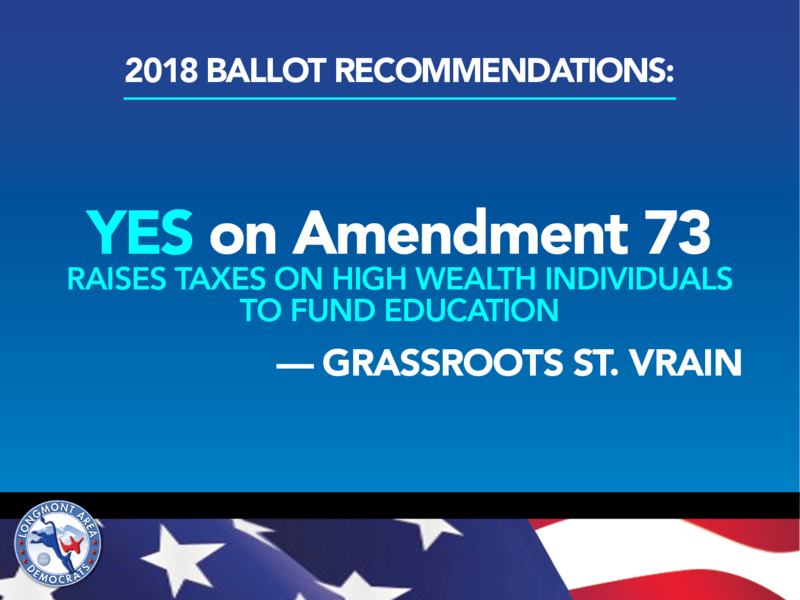 YES on AMENDMENT 73: A tax that will not be imposed on the folks in Colorado who make $150,000/year and under (92% of Colorado filers). Colorado has the 3rd lowest tax rate in the country, with this new tax it will be the 9th lowest. But it would raise the funding per student closer to the national average. And the funds raised would only be used for education. 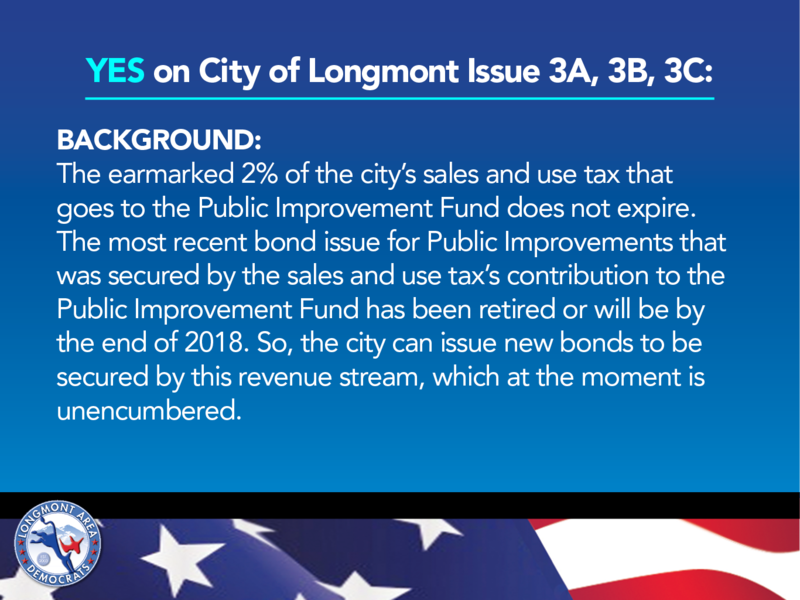 NO on PROPOSITION 109: Be very skeptical of any proposition that requires funding, but doesn’t raise taxes. If the objective was not being performed previously, it’s because funding was used for other things. And if you don’t raise taxes to perform objective, you are most likely taking funding from other areas — like education and medicaid. 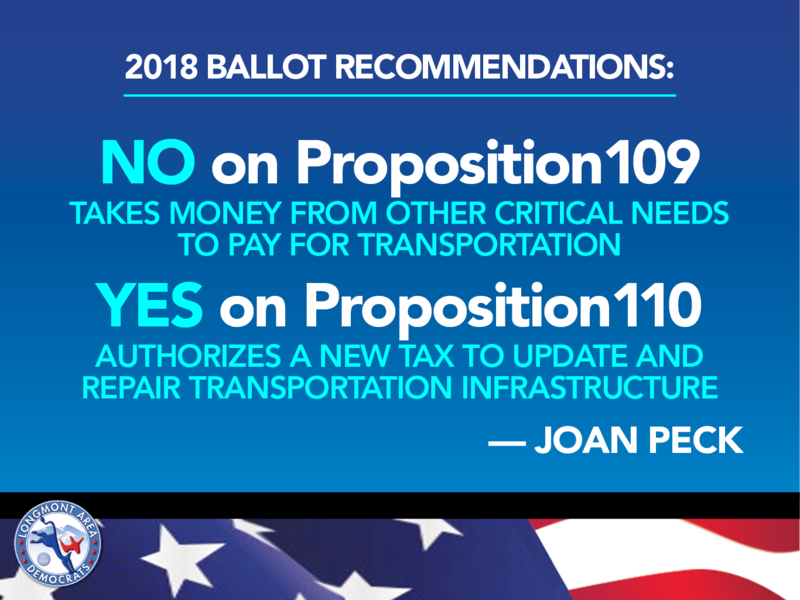 Besides that, none of the projects Prop 109 is proposing are “shovel ready”. CDOT is presently $1 billion in the hole. 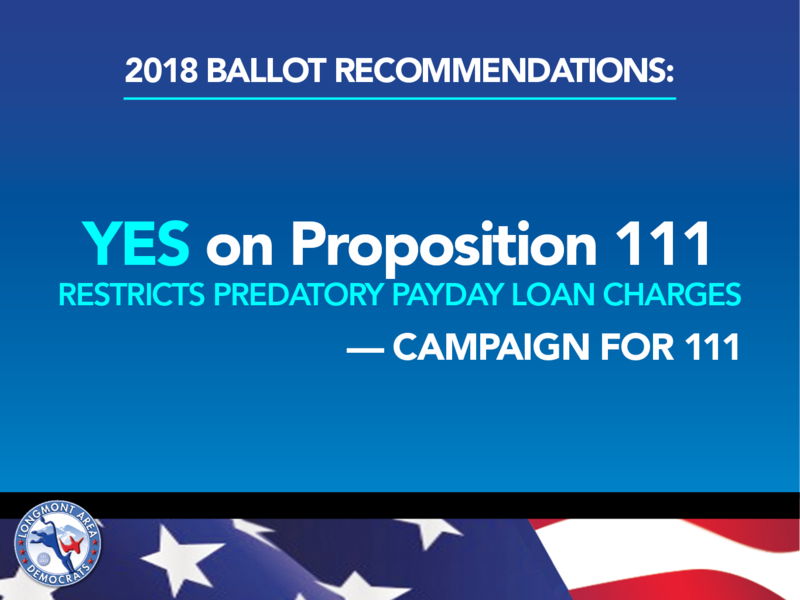 YES on PROPOSITION 110: will raise taxes 6 cents per $10. Money will go directly to cities and counties, and will be dedicated to transportation, nothing else. 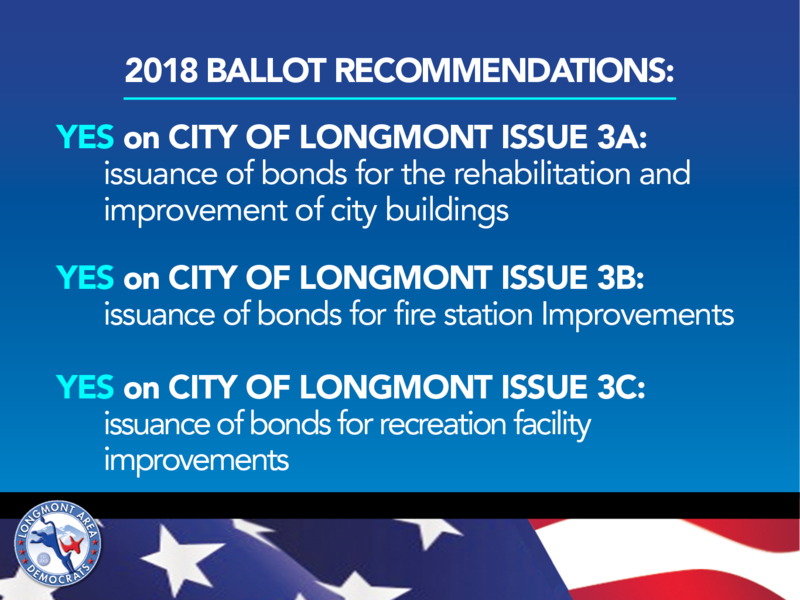 Boulder County will get $251 million, Longmont will get $89 million. 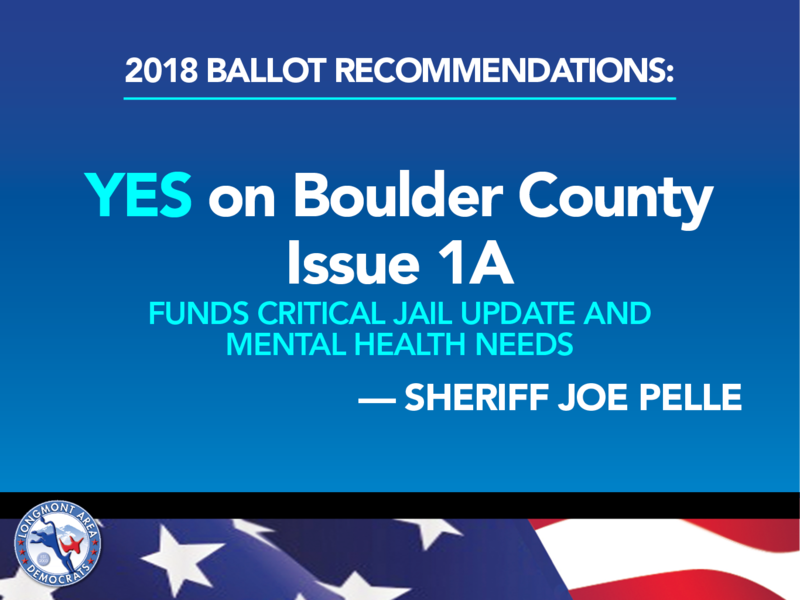 YES on BOULDER COUNTY ISSUE 1A: The Jail Complex has not been updated for over 30 years, but the mental health needs have increased dramatically. (Editor’s note: The psychiatric wing having been closed several years ago at Longmont United Hospital certainly contributes to this.) These services are presently outsourced within crowded conditions at a cost of $132/day (outsourced means profit-driven, not incentivized). The proposal would not increase the jail size per se, but would move the nonviolent offenders from the jail to a new mental health complex at a cost of $40/day. This tax takes the place of the tax for 2013 flood relief that is about to expire. The rate is .185% or 18 cents/$100. NO on Amendment 75: This amendment, created by Republicans, purports to “close the millionaire loophole”. 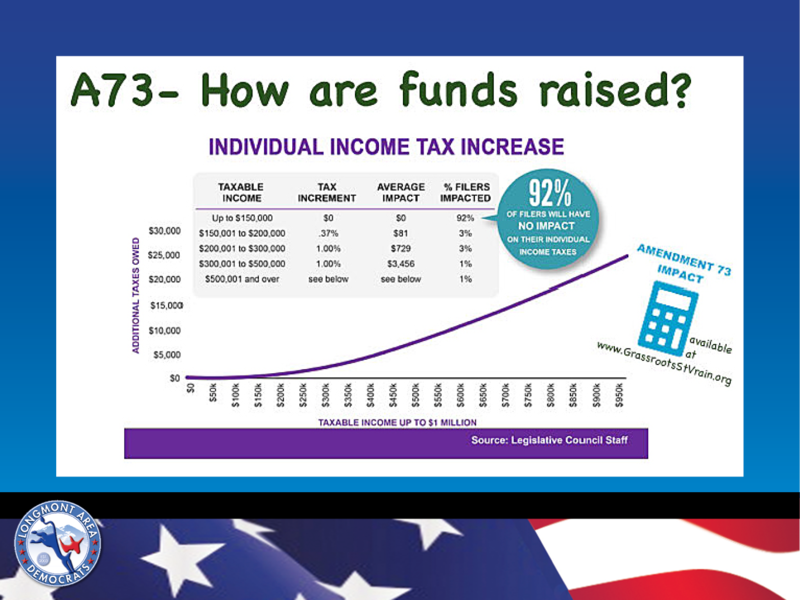 But 75 actually hurts the campaign finance reform Colorado already has in place (created by Common Cause Colorado and passed by a 66% vote from the citizens of Colorado in 2002), by opening up the possibility of more money pouring into campaigns from 3rd party groups. Although we should be ever vigilant to maintain campaign finance reform, 75 isn’t the way to do it. “We don’t believe the solution to money in politics is more money in politics,” — Caroline Fry, Colorado Common Cause “The whole theory of leveling the playing field by quintupling contribution limits — all this is doing is opening our elections to more big spenders.” More here. 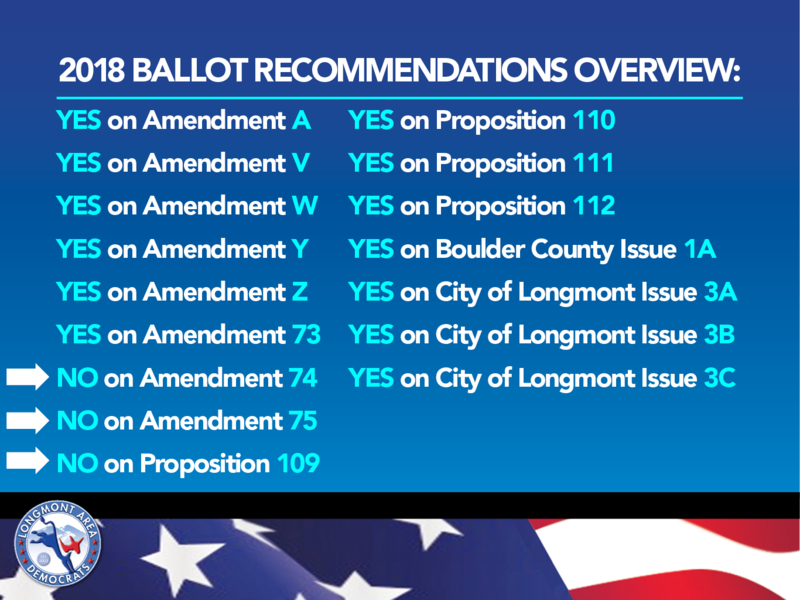 Your vote on the 2018 ballot determines the retention of 1 justice on the Colorado Supreme Court, 4 judges on the Colorado Court of Appeals and 2 District Court judges in your judicial district (in Boulder County, that is the 20th Judicial District), and 2 County Court judges (for the County of Boulder). We will not provide a recommendation to you as to whether or not to retain a judge, but provide available information to make that determination on your own. Including, the current political makeup of our Colorado Supreme Court, based on the affiliation of the Governor who appointed the justices. Currently with 7 justices on the Colorado Supreme Court, 6 were appointed by Democratic Governors and 1 was appointed by a Republican Governor. 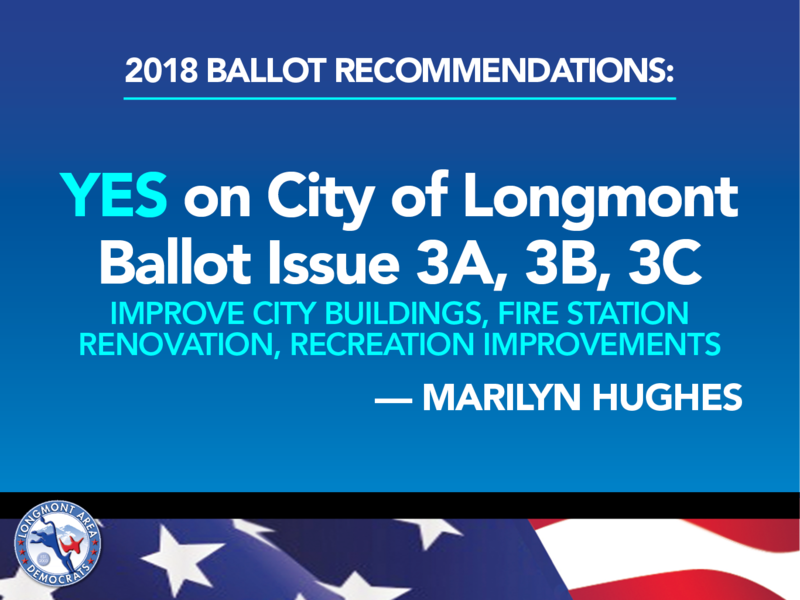 Links to and text from the Colorado Office of Judicial Performance, which is the same text in the Blue Book (2018 State Ballot Information Booklet) that each voter received in the mail from the Colorado Secretary of State’s office (pages J5-J8, pages J20-22). You will find additional information on the Colorado Office of Judicial Performance, website, including how judges are appointed, etc. This is the political composition of the supreme court heading into the 2018 election. Justices in Colorado are appointed by the governor and retained by voters thereafter. Justices Nancy Rice, Richard Gabriel, Brian Boatright, William W. Hood, Melissa Hart, and Monica Marquez were appointed by Democratic governors. Justice Nathan Coats was appointed by Republican Governor Bill Owens. Here is the page for Justice Richard L. Gabriel from the Colorado Office of Judicial Performance. 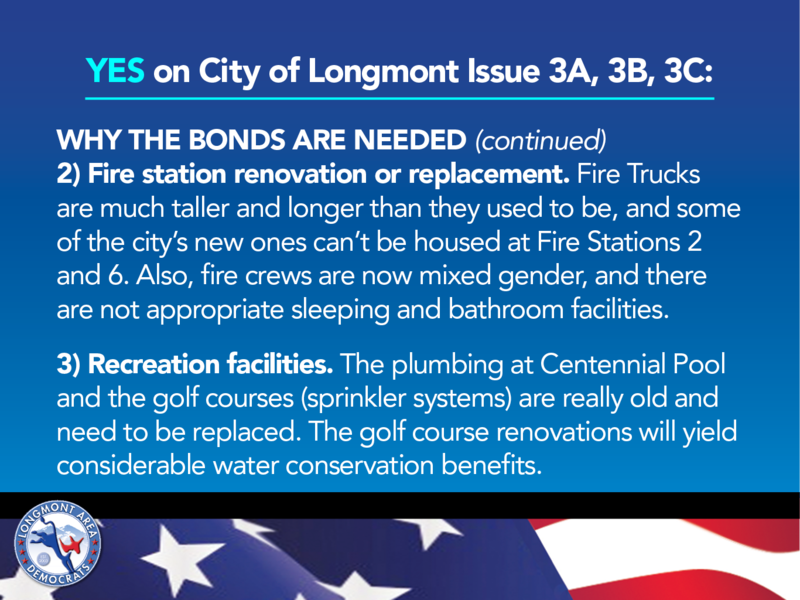 RESIDENTS OF LONGMONT SHOULD TAKE NOTE: As you remember, Longmont passed a fracking ban by a 60% vote in 2012. In 2014, Boulder District Court Judge Dolores Mallard ruled the ban invalid. The Colorado Supreme Court then ruled to uphold the District Court’s decision in 2016. Justice Gabriel — up for retention on your ballot — delivered the Opinion of the Court, here.